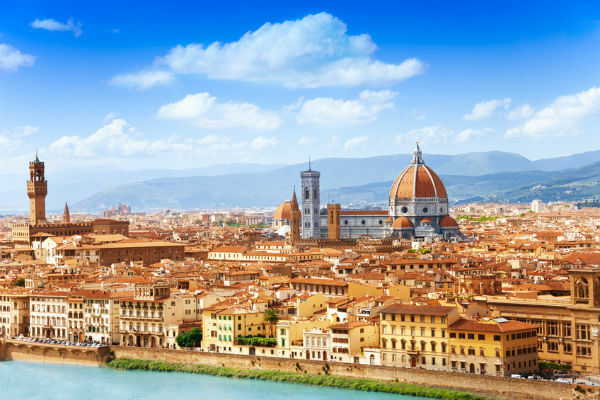 Italian Renaissance elegance gives Florence an unequalled aesthetic appeal, combined with famed cultural venues, the city is a must-see for any history lover. From the architectural wonders of the UNESCO-listed historic centre of Florence to Giotto’s frescoes, Michelangelo’s David and canvases by Botticelli, Leonardo da Vinci and other greats, there’s so much to discover in this outstanding city. Aside from a phenomenal art scene, you’ll also find vibrant restaurants and nightclubs, along with an abundance of inspiring opera and classical music. For fine dining, Florence is packed with Michelin star restaurants to savour the delights of Tuscan gourmet cuisine with the three Michelin-starred Enoteca Pinchiorri perhaps the highlight. For vegetarians too, there are several outstanding restaurants to choose from. Florence boasts efficient public rail and bus systems but if you’d like to avoid the masses, the Uber app will conveniently get you a cab ride in minutes. Due to the city’s overwhelming beauty, backpackers flock to Florence and low cost hostels are plentiful, even in the most central areas of the city. Women travelling solo are very safe to wander about in Florence. That’s not to say there isn’t any crime at all, so stay alert to pickpockets and stick to well-lit, populated streets at night. Florence is gay friendly and home to several well-established LGBT venues in the city centre and surrounding area. Arrive in Cagliari by sea to fully appreciate the maze of golden coloured palazzi, domes and facades as they rise to the rocky Il Castello. Vespas buzz down leafy boulevards and locals hang out at cafes tucked under the elegant arcades. Everywhere you go, Cagliari’s history spells itself out in archaeological treasures, Roman ruins, churches, museums and galleries. To the east of town, Poetto Beach is the hub of summer living with its azure waters and upbeat party scene. La Paillote, above Calamosca Beach, has a beautiful lounge bar with views over the tiny beach and harbour. Craving a memorable seafood lunch? Go to the San Benedetto fish market to devour freshly fried calamari, shrimps and other fish for just a few euros. Nearby, the popular La Stella Marina di Montecristo in via Sardegna serves an excellent seafood menu at a reasonable price. If you have a penchant for pizza, pasta, meat and desserts head for popular L’Oca Bianca. Vegetarians eat well too – hunt out the seven vegetarian restaurants dotted throughout town. If you would like the company of other travellers, expats and locals, why not join the meet up group and have a drink and a chat in the centre of Cagliari? For a charming, good old-fashioned welcome, Cagliari’s bed and breakfasts outshine its hotels. There are plenty in the district of Marina (Hostel Marina has dorms of 4 to 6 beds) in the heart of the city, near the tourist attractions, or in the quieter Il Castello area. Although homosexuality is legal, Sardinian attitudes remain quite conservative so discretion is key. That said, Cagliari is one of the most tolerant places on the island. Check out Movimento Omosessuale Sardo in Sassari for listings on LGBT venues in Sardinia. There’s a charm to Palermo which brings surprises and treasures on every street. Start by wandering through the old city with its incredible mix of architectural styles. Don’t miss the sumptuous Palazzo dei Normanni, gleaming with mosaics. In the medieval quarter of La Kalsa, washing is strung between the narrow streets while elsewhere you’ll find elegant villas with palm trees. Aside from quaint churches, palaces and several lively markets, you will find beaches and mountains within easy reach. So once you’ve discovered the city, you could hike the old pilgrim’s way to Saint Rosalia on Monte Pellegrino in just under two hours. The Madonie Nature Park is also excellent for walkers and nature lovers. Mount Etna is well worth a day trip from Palermo too. A cable car runs you up the mountain to explore the four main volcanic craters that dimple the sides. For beaches, Sicily doesn’t go short. There are several to bask on in Palermo or within an hour’s drive, including Arenella, Mondello, Aspra, San Vito Lo Capo, Cefalu and Isola delle Femmine. Single solo travellers are generally free to sunbathe peacefully. Backpackers will find a handful of hostels, bed and breakfasts and rooms for rent. However public transport is scanty and food and entry into tourist sites can be costly which keeps many budget travellers on a tight schedule at bay. Gay and lesbian bars in Palermo are picking up. A popular meeting place is Exit on Piazza San Francesco di Paola which often offers live music in summer on the beautiful square. Take time to marvel at Rome’s exceptional cultural riches in the historic centre and savour velvety cannelloni, washed down by rich red Valpolicella wine. Rome boasts an abundance of UNESCO World Heritage sites including Roman ruins, glittering Byzantine treasures and frescos that history buffs won’t want to miss. And for a look at local life, Campo dei Fiori, the most famous outdoor market in Rome, bustles amid atmospheric medieval buildings. Once you’ve seen the sights, why not meet up with fellow visitors or locals to enjoy Rome’s food and wine, or take an amazing night walk with others in the heart of the city? Rome’s metro offers rather limited coverage of the city but the stops at The Colosseum/Roman Forum and Spanish Steps are adjacent to the sights and within five minutes’ walk of the Vatican and St Peter’s Square. If you’d prefer the luxury of a cab, the Uber app gives you quick access to a ride in Rome. Dining out is one of Rome’s great pleasures so do it in style whether you’re in a small local trattoria, a Michelin-starred restaurant, such as La Pergola, or in one of the city’s many vegetarian restaurants. Rome has a thriving, yet low-key gay scene, reflecting its relatively conservative attitudes. San Giovanni in Laterano is dotted with several lively gay bars – try Coming Out and My Bar. Settimo Cielo at Capocotta is a popular gay beach. Single females are safe enough in Rome, bearing in mind that Italian men are just as amorous as ever! Don’t be afraid to go out and explore. Rome is stunning in the evening. Backpackers find plenty to do on a budget and there are several central, low cost hostels to choose from. Venice feels like you’re part of a Renaissance painting. From waterfront palazzos and gondola rides to famous bridges, fresh pasta, gelato and nights at the opera, this is a city you should visit at least once in a lifetime. What better way to start your Venice holiday than to ride the canals on an elegant gondola and step straight into your hotel? It’s more romantic than a taxi or even walking the streets. Away from the canals, Venice and its lagoon combined comprise a UNESCO World Heritage site and the area in and around Saint Mark’s Basilica is favoured amongst visitors for good reason: it hosts some of the most impressive Renaissance architecture in the world. The surrounding area of Castello is just as magnificent with its elegant palazzo hotels. Venice isn’t only about architectural marvels, canals and museums. When you’re ready to cool off and kick back on the sands there’s Venice Lido, the city’s beach. Trendier and more residential than traditional Venice, the lido offers small canals, impressive views of the city from across the lagoon plus a good variety of dining experiences – don’t miss the seafood at Trattoria Andri, where Michael Douglas and Catherine Zeta Jones have dined. Venice also offers a good range of vegetarian restaurants to suit all tastes. Solo travellers looking for a little company can meet up to share with like-minded people in a whole range of fun activities in the city. Venice is relatively female friendly, there are no “no-go” areas so don’t be afraid to explore, even by night when much of central Venice is lit up. It’s also gay friendly with plenty to do on the LGBT scene.